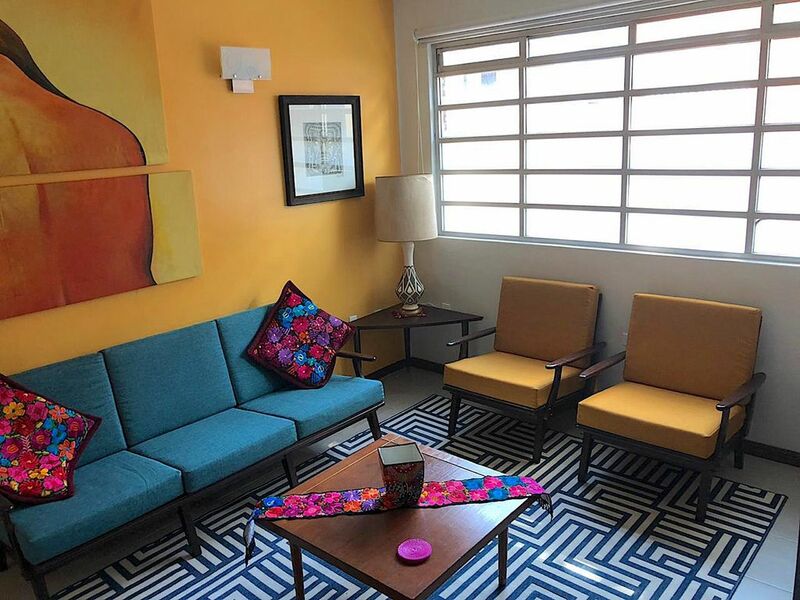 If you are passionate for Frida Kahlo & Diego Rivera's artwork, you will love to stay at our house. We put ourselves to the task of gathering copies of some of their most representative work to decorate our house and turn it into a very nice pictorial space. This house is located less than 2 kms. away from the WTC, in a centric area, with all kinds of services at the reach of your hand. This is a spacious 2-flat house decorated with a fresh eclectic style, located in a centric and accessible area, with all kinds of services and transportation means at your fingertips. The house features 3 bedrooms where up to 9 persons can sleep comfortably in 6 beds (ideally 7 adults & 2 children). It is the perfect place for families with children of all ages. *Child safety gate on top of stairs. *Security iron door at the bottom of the stairs. *Cistern & two 1,100 lts. water tanks to guarantee the water supply. WE WANT TO INFORM ALL PERSONS INTERESTED IN BOOKING THIS RENTAL THAT A CONSTRUCTION IS ABOUT TO BEGIN ACROSS THE STREET IN FRONT OF OUR HOUSE, AND IT COULD HAVE ALREADY BEGUN BY THE TIME YOUR STAY TAKES PLACE. THE CUSTOMARY NOISES OF A CONSTRUCTION COULD BE HEARD DURING THE DAY, AND FOR THIS REASON, WE WILL BE OFFERING THIS RENTAL AT A REDUCED RATE OF JUST $99USD/N, FOR UP TO 6 GUESTS, DURING ALL 2019 (EXCEPT FOR THE F1 RACE - OCT. 24 THRU OCT. 28 & THE WINTER HOLIDAY SEASON - DEC. 2O THRU JAN. 2). UPON HAVING MADE A RESERVATION, IF THIS SITUATION RESULTED IN DISCOMFORT, WE WILL ACCEPT THE CANCELLATION WITH THE CORRESPONDING REFUND FOR THE NIGHTS NOT SPENT. *The base lodging rate is on a per night basis, for up to 6 guests, in 2-nights-minimum stays. A charge will apply for any additional guests. *Be aware that, in any case, the check-out cleaning fee, HomeAway's fee for its services, and the corresponding taxes, are always added to the lodging concept. *Our official check-in time is 3:00pm. Our official check-out time es 11:00am. WHEN THERE ARE NO OTHER GUESTS CHECKING IN OR CHECKING OUT ON THE SAME DAY, as a courtesy, we can allow early arrivals and late departures. The earliest check-in time from Monday to Friday is 9:00am; on Saturdays & Sundays, 11:00am. The latest check-out time from Monday to Friday is 5:00pm; on Saturdays & Sundays, 3:00pm. Please take this into consideration when planning your trip. *With every booking, we charge a check-out cleaning fee to make a thorough cleaning after our guests leave. *Be aware that the cleaning during your stay is not included. Cleaning services can requested, booked and paid for in cash to our manager at any time during your stay. *We strongly suggest putting all valuables and money inside the safe on clean-up days. One huge advantage for your travel agenda is our location, you can have everything you need during your visit within a short walking distance, and won’t believe how easy it is to move in and out this centrally located area where there’s no place in the city too far to reach out. In our area there are 2 subway stations and 2 metrobus stations. There are also 2 Eco-bici stations, and if you like to ride a bike and would like to savor the city in a more hip way, you can hire this service during your trip. If you prefer to move around in a taxi, we strongly suggest the use of private units. We have included the telephone number of a Elite, a private cab company. You can also download the UBER or CABIFY applications in your cell phone so that you can request this service at any time anywhere in the city. Cabs pick you up at the property in 10 minutes or so and securely deliver you to exact place where you wish to go. We are also very near the south limit of La Condesa and minutes away by car from Polanco and La Roma, so you will be quite close to all the main city attractions like Reforma Ave., Chapultepec Park and Castle, the museums area, the zoo, and much more. Our guests simply cannot believe how easy it is to go to and from our neighborhood to any other point in the city! P.S. We suggest our guests, especially those who are visiting Mexico City for the first time, to take the hop on - hop off Turibus. it is an easy and quick way to get a general overview and see the most representative spots in the city. Smoking is ONLY allowed in the upstairs balcony. The Escandon neighborhood was founded in the early 19th century and was part of the Hacienda de la Condesa, it is divided into 2 sections: Escandon I & Escandon II. There are all kinds of businesses in our area within a 5 block radius - there are several convenience stores, a typical fresh-produce market, restaurants, coffee shops, bakeries, pharmacy stores, banks with ATM machines, barber shops, plus much more. Furthermore, you can walk to the Metropoli Patriotismo mall which features a Cinemex movie theater complex, and which lies a bit over a kilometer away.